Mr. Arend “Don” Lubbers, as president of Grand Valley State University (GVSU), championed and supported the establishment of the first university academic center on philanthropy in Michigan. Later named in honor of Dorothy A. Johnson’s career in the sector, the GVSU center is one of the largest and oldest of its kind in the nation. Mr. Lubbers knows Michigan’s philanthropic community from the perspective of a university president and long-time participant in public-private joint ventures. His insights are drawn from a refined understanding as the leader of large institutions and significant strategic initiatives. 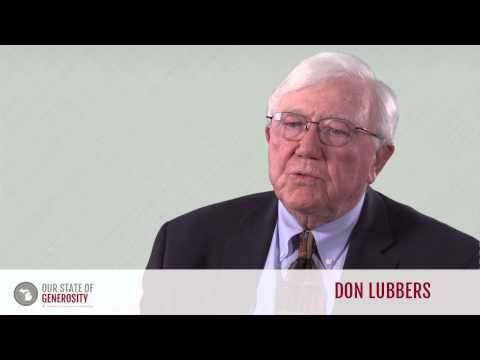 Mr. Don Lubbers talks about his career in philanthropy. Mr. Don Lubbers talks about the remarkable leadership of Russ Mawby. 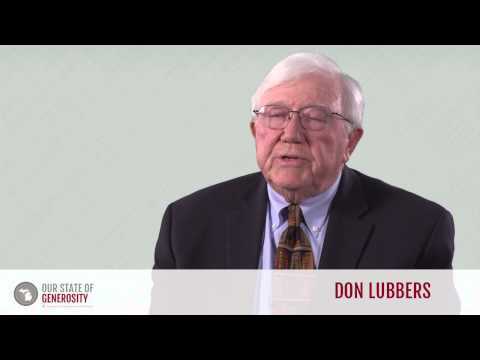 Mr. Don Lubbers talks about how and why Grand Rapids and Grand Valley State University became home to the Dorothy A. Johnson Center for Philanthropy. Mr. Don Lubbers talks about why Grand Valley State University chose to name their center for philanthropy after Dorothy A. Johnson. Mr. Don Lubbers earned his applied baccalaureate degree from Hope College, and then his Master of Arts degree in history from Rutgers University. He returned to Rutgers University in 1958. Growing up, Mr. Lubbers spent a considerable amount of time on college campuses, as his father was president of Hope College from 1945 until his retirement in 1963. These childhood experiences helped Mr. Lubbers become intimately acquainted with fundraising, as well as introduced him to the importance that philanthropy plays in a community. After obtaining his master’s degree from Rutgers University, Mr. Lubbers spent two years teaching history at Wittenberg College in Ohio (1). In 1960, Mr. Lubbers became the vice president of development at Central College in Pella, Iowa, and moved into the role of president a year later. 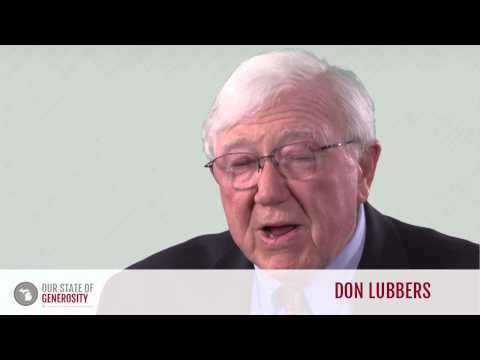 At the age of 29, Mr. Lubbers was the youngest college president in the country. While in this position in 1962, Life magazine named him among the top 100 American leaders under 40 years of age. January of 1969 saw Mr. Lubbers’ departure from Central College and the beginning of his long tenure as president of Grand Valley State University (GVSU). Under his guidance the university grew tremendously, greatly expanded the number of educational programs it offered, and created a regional campus in Holland (2). Mr. Lubbers served as president of GVSU for 32 years, retiring in 2001 as the longest-serving public university president in the nation. 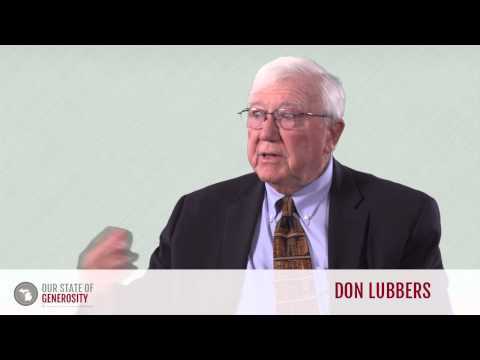 In essence, Mr. Lubbers guided the transformation of a small liberal arts college into the fastest growing institution of higher learning in Michigan (3). Mr. Lubbers led Grand Valley State University’s application to the W.K. Kellogg Foundation to launch a new academic center focused on philanthropy. Mr. Lubbers understood that West Michigan citizens are extremely philanthropic. Just prior to the launch of the philanthropy center, several major donors and foundations realized they needed more information and data regarding the nonprofit organizations they supported. To meet this need, GVSU, along with the Heart of West Michigan United Way and the Grand Rapids Community Foundation, collaborated to form the Direction Center. The Direction Center provided management aid to nonprofits, as well as research to give donors more information regarding how their money was being used. “Often initiatives like that [creating the academic center], when you are trying to get them started, a university will place them in an existing structure. That is usually fatal because that structure already has its purpose and understanding and interests, and it is pretty hard to do it. That is why we started a new kind of curriculum, separate from what existed, and a new kind of research capability and consulting capability, which was outside of anything that existed. I think that helped it to grow and sustain itself. This initial response to the needs of the nonprofit and foundation community provided a sound basis for GVSU to apply for the competitive Kellogg Foundation grant. President Lubbers explained that Grand Valley was an institution founded through community leadership. With this, it was a natural fit for the philanthropy center to be located within Grand Valley to strengthen the university’s work on philanthropic and nonprofit research, management, and curriculum. GVSU received the W.K. Kellogg Foundation grant in 1992 to launch the Center for Philanthropy and Nonprofit Leadership, in part, because of the commitments made by the university. These included matching the Kellogg grant with $922,000 in university funding (and continued annual financial support over the past 20 years). When Ms. Dorothy A. Johnson announced her retirement as the long-time CEO of the Council of Michigan Foundations, individuals who were involved in foundations and who served on the university’s board wanted to honor her remarkable achievements and impact on Michigan philanthropy. Mr. Lubbers recalled that it was quite natural to look at Grand Valley as being the place to honor Ms. Johnson due to her connections with the university, as well as the university’s existing center for the research, consulting, and formal academic education in philanthropy. In 1999, Grand Valley’s Center for Philanthropy and Nonprofit Leadership was renamed the Dorothy A. Johnson Center for Philanthropy. In addition to the renaming, the Council of Michigan Foundations donated its library, built over 27 years, to form the heart of the Johnson Center’s philanthropic collection. A statewide campaign was launched to create an endowment to support the maintenance and growth of that library collection in perpetuity. It was President Lubber’s entrepreneurial energy, close ties with the greater West Michigan nonprofit and foundation communities, and his willingness to take a risk in committing to a formal academic center on philanthropy that brought the center to GVSU. Other universities in the state of Michigan had longer histories, substantial scale, greater national prestige, larger graduate and research programs, and greater financial resources. GVSU, under Mr. Lubber’s leadership, had deep community roots, aspiration, and commitment to new ideas — qualities that put it in sync with the values of the greater Michigan philanthropic effort. Additionally, Mr. Lubbers has devoted time to community organizations such as the Grand Rapids World Affairs Council, the Arts Council of Greater Grand Rapids, the Grand Rapids Symphony Society, Butterworth Hospital, and the Grand Rapids Community Foundation. Mr. Lubbers was interviewed regarding his insights and experiences in working with Michigan’s philanthropic community and the Our State of Generosity (OSoG) partners. The following are selected quotations from his interview specifically related to the five organizing themes of the OSoG project.